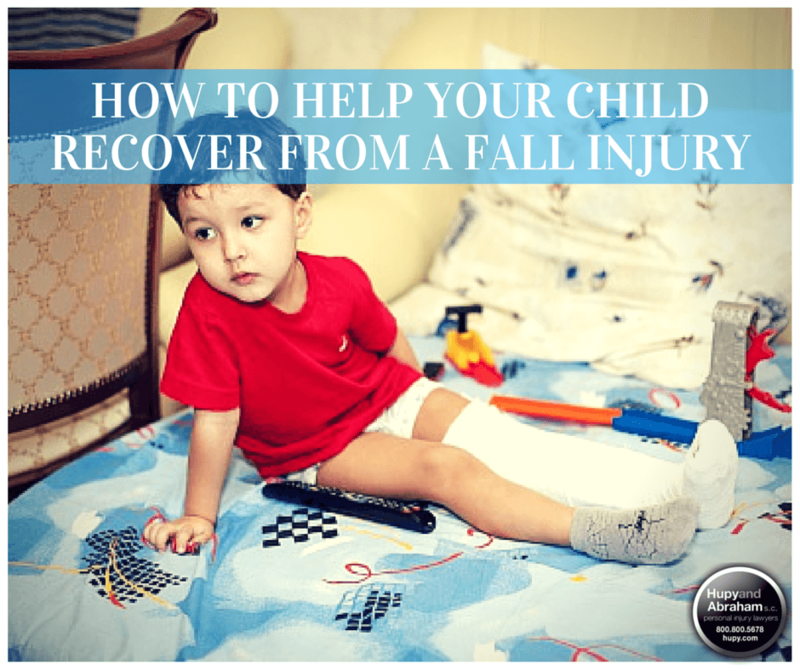 How to Help Your Child Recover From a Fall Injury | Hupy and Abraham, S.C. Your child was hurt in a fall accident, and it wasn’t because of your child’s carelessness or your lack of supervision. Instead, your child was hurt because of a dangerous condition on the property. You can’t turn back time and keep your child home to avoid the accident. You can’t undo the harm that has been done or spare your child all of the pain and suffering that comes along with a serious fall injury. Your child gets the medical care that he needs. The exact nature of the medical care will depend on his unique injuries, but may include ongoing doctor’s appointments or rehabilitation therapy appointments. You have the resources to get the best care possible. Your child may need extended physical therapy, surgery, or other medical care. You shouldn’t have to pay those bills if his slip and fall injury was caused by someone else’s negligence. Instead, you may need to file a legal claim to get the necessary resources from the homeowner’s, renter’s, or property owner’s insurance company. A legal action need not be personal and it may be possible to maintain your relationship with a person who was caring for your child at the time of the accident. Your child knows it was not his fault. Your child did not do this on purpose and he is not to blame. You can make sure he knows that and does not blame himself for what happened. Of course, you can also continue to comfort him and make his recovery period more tolerable. You don’t have to do everything alone. We have the experience and the drive to help you help your child get the recovery he deserves in a slip and fall case. Please fill out the contact form on this webpage or call us directly for more information. Should I Call a Lawyer If My Child Was Hurt in a Slip and Fall Accident? Has Your Child Missed School Because of a Concussion?